We have created a Scripture Guide that will provide the serious reader of the scriptures an easy and fun way to complete the entire Quadruple Combination (The Bible, Old and New Testament; The Book of Mormon; Doctrine and Covenants; and the Pearl of Great Price) within one year by sacrificing only one-half hour each day. One-Half Hour each day to keep your spiritual strength up and to open up the mysteries of God’s kingdom. The Scripture Guide is beautifully printed in full color with scripture readings and instructions for each day of the year. It makes an excellent gift for friends, family and other Church members. Each day is further broken down into four short reading segments, one from the New Testament, two from the Old, and one from our modern day scriptures. The Guide measures only 5 1/2″ wide by 8 1/2″ tall, and so should fit nicely within most standard size scriptures for easy access. The Guide provides a check box next to each scripture segment, so as the individual completes a segment of reading for the day, they can check it off as read and avoid confusion as to where to start again for the next reading session. 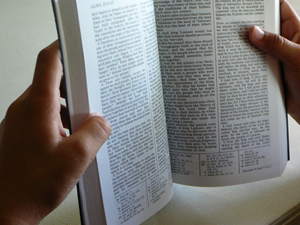 Although the Guide begins in January, the check boxes allow the individual to start their study of the scriptures on any day of the year, to finish their study at the same time next year (and to begin again for even more blessings and revelation). The check boxes also allow the individual flexibility to read segments from other days without losing track of where they were in the other segments, so if a certain reading is very interesting and the individual would like to continue reading in that area, they can substitute one of the segments from the next day for one that was assigned for today, and do the one assigned for today on the next day. The secret to staying on track with this method is to simply be sure to complete four segments each day. The guide is also arranged to bring certain related themes from all the books together from time to time during the year. This allows for excellent ministration by the Holy Ghost to reveal the secrets and the mysteries of godliness to our hearts and minds. As active members of The Church of Jesus Christ of Latter-day Saints, we can testify to the power and blessings that one receives as one reads, studies and ponders upon the Word of God within one’s heart. Within their sacred pages one finds an immeasurable wealth of knowledge, wisdom, intelligence, understanding, revelation and insight. Our goal and desire is that all men (and women) obtain the good and pleasing Word of God. In order to accommodate the busy schedules and challenges faced by members of our Church, we are offering a valuable tool which can provide them guided assistance as they study God’s Word in an organized and highly satisfactory manner. To purchase one or more now, click on Buy Now. Copyright © 2019 by ReadTheStandardWorksInOneYear.com. All rights reserved.